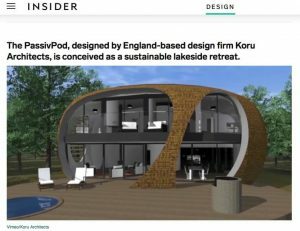 The popular news and entertainment website Insider.com has included our PassivPod in a list article about off-grid tiny homes that can replace your house. We are very happy to be recognised by such an established online publication with a large social media following. (They have over 24,000 followers on Twitter). One thing we would add though: the standard PassivPod is not exactly ‘tiny’. It’s the size of a 4-bedroom detached house – which explains why the price seems high compared to the others on the list. However due to popular demand we are working on a medium and small model to cater to a wider audience. You can click here to read the whole article on Insider.com. And you can click here to find out more about PassivPod.